Burl Ives sang of "Silver & Gold", for me though, it's all about Silver & Blue. 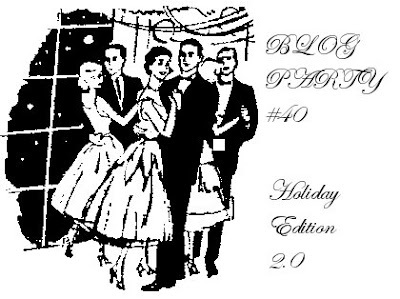 Welcome to the Holiday Edition of Blog Party, version 2.0! I've spent the week turning this place into a bit of a party palace; silver & blue decorations everywhere, touches of greenery, maybe even a little snow (What? I'm a Yankee living in the South. I miss it.). 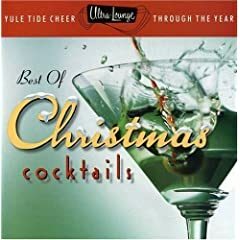 Fantastic tunes to help the festive mood along, and of course...incredible holiday bites & beverages! And I must add: you ladies look gorgeous! Bold colors, lots of sparkle...you girls know how to dress up, that's for sure. I found this pretty set of plates and cups and more, all in that cool winter blue & silver, and I think it looks fantastic. Ignoring that 'sensible' voice in my head (one of several, to your complete non-surprise! ), I've scattered this wonderful, retro fake snow over mantles and table tops...it's as close to the real thing as we're likely to get here! Hey, that's what shop vacs were created for, right? The rooms have been strung with these lovely blue party lights. For me, it's music that really gets me in the mood, and weather you celebrate Christmas, Chanunakah, or Christmakuh, you can't deny the all-around good vibes given off by those classic tunes. 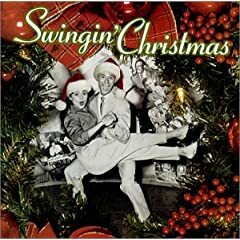 And when they're performed by such hip acts as Dean Martin, Ella Fitzgerald and the like, well...I don't know you much more 'Holiday' spirit you could cram into a room! Ok, we've seen the decor, we know what's playing on the stereo (yes, a stereo...no iPods here! ), now it's time for the good part: the food! Our first guest tonight, Judith starts things off with a trip down memory lane;; perfect for the holidays! Food is deeply connected to memory, so what better way to evoke a bit of home than be sharing these tasty Parmesan & Rosemary Shortbreads? She's also ready to pour you a glass of Arbor Mist, which just seems to darn friendly, if you ask me. It's always a pleasure to see you, Judith! Mary returns,just in time to wish us all a happy holiday! She not only got all dolled up for us tonight, she managed to clear a bit of space in freezer getting here! 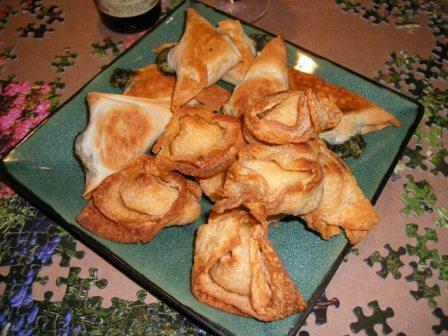 Surprisingly staying within the bounds of her inspirational Pantry Plan, Mary's serving up some rather elegant fare: Crab Wontons & Spinach Pockets. Yum! Adorable single-serve bottles of Prosecco are on hand for all; how perfect. So very good to see you, Mary! Natashya's next, but decided to leave the puppies at home this time...too many fancy dresses tonight, I suppose! She may have left the dogs behind, but she's certainly brought on the sweet with these diet-tempting Big Soft Ginger Cookies. Matt's been eyeing them since they showed up on the table! Natashya claims they're 'grown-up' cookies, but there's no mistaking the adult-ness of her Mother's Little Holiday Helper! I hope I didn't disappoint too much, with my semaphore-led carols; day 4 of Laryngitis Watch! Thanks so much for coming, Natashya! Deb's here! !Don't mind us; we start talking about our love of those Southern vampires, and kind of lose track of time...fortunately, Deb's brought some wonderful little bites to tide you over: Cured Salmon Morsels & tiny Cheeseballs with Pignoli Nuts. I was hoping someone would bring salmon! Keeps the hubby happy. Great to see you, Deb! After an incredibly long absence, she's back, and I know you're as happy to see her again as I. For her return, she's offering up these not-too-sweet Chocolate Fruit & Nut Cookies; looks wonderful! It's considerably warmer in Trinidad than Tennessee, and while my throat doesn't hurt, the coughing is driving me nuts. Warm beverages soothe, so I'm going straight for Sarina's Iced Lemon Ginger Tea...and sticking it the microwave! It wouldn't be Blog Party if J didn't come rushing in at the very last minute, right? But no matter how by-the-seat-of-her-stylish-trousers her arrival, her party offerings make us forget all about space & time. 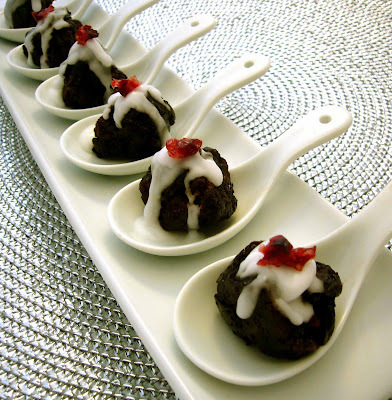 Like those eye-catching Mini Christmas Puddings, or the Smoked Salmon-laden Trees. Don't forget the Pesto-Topped Rare Beef Bites on Salt & Pepper Crisps (that's potato chips for our US guests). Or the Cheese & Cranberry-Stuffed Chicken Bites. Then there's the Clementine Fizz,served alongside some Dark Chocolate-Dipped Clementines. Whew! No wonder it takes her so long to get here...she's carrying a lot of food! Great to see you, J, as always. It's funny; I thought I had a plan for the food tonight, but the whole house got sick & I found I'd left it to the last possible minute. Not good hostess behavior, I know & I apologize. Also, not contagious, so you're all fine. When your RSVP's started coming in, I of course was awed by all the amazing dishes you'd come up with, but I think I was most impressed...or perhaps most Inspired by, Mary. Coming up with the entire party spread with items already in her kitchen. So last night, that's what I did. I took stock of what was in the kitchen and pantry area, and I must say...I'm rather pleased with the outcome! It may be elegant and/or decadent, but by golly...it was useful, too. First, wonderful little Cheese Tart Bites. I love cheese tarts, and they're so easy to make. Using puffed pastry from the freezer, the remnants of at least eight kinds of cheese, some thyme from the garden (still going strong! ), a few of the remaining eggs in the refrigerator, and pine nuts, also from the freezer. Not too rich, slightly smoky. Very good. Too good...I ate three before I set them out tonight! Fried Black Bean & Habenero Ravioli, with Salsa. Not much to say about this, except I once again used something from the freezer. We bought these raviolis months ago; we keep a few flavors around for emergency dinners. Thawed & fried briefly in a hot oil, and served alongside a spoonful of some chipotle salsa left from another meal. Good crunch, a nice heat but not too spicy. And fun to eat! Taking advantage of the phyllo I bought for something I never got around to making. And that jar of Nutella in the cupboard. Another case of using it all up...in my refrigerator, I found a container of crystallized vanillas sugar syrup. Generously flecked with seeds, it had been left over from something I made earlier in the year. I hadn't the heart to throw it away at the time. It got pushed to the back of a shelf, behind 'things'...and well, you know the rest. Found it, and decided to get it boiling, add the odds & ends of various nuts, and make a candy. It was already vanilla-y, and we decided to add a bit of cinnamon and cayenne. It's lightly sweet, with just a hint of heat & spice. Crunchy. And finally, from bottles already in the pantry, a Sparkling Black Currant-Pomeganate Punch; sweetened a bit with sparkling apple juice. Almost tart, but very refreshing. Well, ladies...it's been a fantastic party! I can only hope you've had as enjoyable an evening as I have. Keep yourself sane during the next few weeks, and I hope to see you all back here in December! SO much fun to be back :D Love the variety of entries, and now I got new blogs to check out :D Whee! As ever the hostess with the mostest Stephanie, well done for pulling it altogether even when you don't feel at your best. And loving the silvery décor, very similar to the twinkly display I'll put on in a couple of weeks. Take care of yourself and if you wouldn't mind passing over those Cheese Tart Bites please, they look yummy! Aw shucks (blushing as close to a Southern belle can for a Northern girl). I'm honored that I inspired you to make such incredible and delicious goodies! I have some phyllo left over from some bakalava I made and those Nutella pouches are going on a plate very soon! Thanks for hosting such a wonderful gathering. I love small and intimate parties. 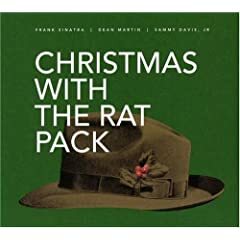 Can't wait for the Christmas version! Great party--silver and blue are my favorite holiday colors. Food, company, everything was fab as usual! Can't wait until next month. To bad about your laryngitis, I hope that my singing twice as loud made up for it! Sorry I couldn't make the party this time - I had great intentions but it's that stupid crazy time of year! Looks like lots of yummy stuff to check out. 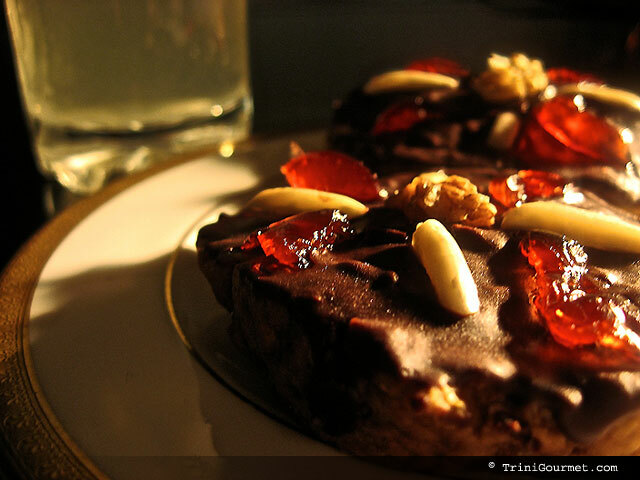 The TriniGourmet; good to have you back! breadchick; no, thank you! Actually, ever since you I heard about the PP I've been trying my best to use what's already here. Many dinners have developed from that. Thanks Deb! I'm a bit late this month...the party & Alex getting sick have really thrown me for a loop...soon, promise! Natashya, I'm so happy to hear that! I was without voice for almost a full week, and still dropping sounds & words for another four or so days. Nuts, I tell ya. BV; it's time, isn't it? !